Earlier this year I told you I was going to write my blog only twice a month. For the past year, I had published at least once a week but I wanted to carve more time to write my books and develop my business. However, I quickly discovered that not only was I not writing, but I wasn’t researching, commenting on other blogs or even tweeting about my blog. I needed to do something different. I decided to watch a video by Michael Hyatt in which he shared 10 ways to boost blog traffic. I’d read articles or viewed videos on just this topic several times since starting my blog so I wasn’t sure what to expect. His first tip was to write content that is worth sharing and his second was to adhere to a consistent schedule. I was struggling with both of those tips because with my new schedule I quickly realized that I would not be able to write content that was worth sharing if I only published twice a month. I wasn’t staying focused on the researching and writing with only publishing twice a month. So, I am going to compromise and post three times each month — around the 10th, 20th and 30th. This will help me to continually seek out ideas and research, and to always be working to write fresh and — I hope — relevant content. Another tip he shared was to make it easy to subscribe to the blog. Since I started, I’ve had a subscribe button on my page. However, I’d been making some enhancements to the blog and adding pages, and I couldn’t recall seeing the subscription button of late. When I checked it was gone. Yikes! I quickly added it, and for this reason alone it was worth it to watch the video. Sometimes it’s good to return to the basics. As I mentioned in my last post, I’ve now written more than 400 posts for my blog. Along the way, I’ve learned a few things. 2. Write about trends and news. I subscribe to numerous publications and receive tons of email filled with reports and statistics. All of that becomes fodder for the blog. I wrote about Pinterest before most of my readers had heard about it. I was already experimenting with it so I wanted to share what I had learned. 3. Post regularly. When I started the blog I committed to posting on Wednesdays and Sundays. I keep a Word document that lists all of the Wednesdays and Sundays. I fill it in with the title of my blog posts. Ideas are listed at the bottom. Key dates such as the NFPW conference are highlighted so I know I’ll have fodder on those days. Keeping a content calendar allows me to plan what I need to write for the blog. This summer I knew it would be a challenge to stick to that schedule so I scaled back to once a week (so I actually followed work/life balance advice). That also meant my blog visits decreased, but I wanted to ensure that I would at least blog once a week. Had I tried to stick with twice a week, I suspect I would have stopped all together. I’ll resume twice a week postings after Labor Day, and I’ve already begun researching and writing a few of those blogs. 4. Post on week days. I have seen this advice numerous times, but I break this rule. Many of my followers are busy communicators so a Sunday post means they have a bit more time to read it. The Sunday post also gives me Saturday as a writing day, which I often need. I also post on Wednesdays for those who are reading at work. 5. Leverage social media. I share my blog on Facebook and LinkedIn. Once in a while I try to tweet it, but I just haven’t embraced tweeting yet. LinkedIn works well for me because it’s a professional audience and members often share my posts, which I appreciate. 6. Leverage SEO. I think about what terms people will use to search and work to weave those into my posts. I sometimes sacrifice a creative headline so I can incorporate the appropriate SEO (Search Engine Optimization) words. 7. Use art to make the post visually interesting. I find that when I include a photo, my blogs are more often read. Last year I had lots of photos because I also was doing a photo a day project, which generated art fodder for the blog. This year I’m struggling a bit to find appropriate art. I also need to build in time to find the art or take photos that would illustrate the point. These tips aren’t magical. They do, however, require work, which is what it takes to have a successful blog. I was reviewing my stats for my blog and discovered that I have written more than 400 posts! The blog began shortly after I was elected president of the National Federation of Press Women. My goal was simple: “I hope to use this platform as a means to share with other members, potential members, and anyone who just enjoys communicating in today’s world.”And thus Cynthia’s Communique was launched. My topics are communications, productivity and work/life balance. I learn as I go. At first I was disheartened because the blog didn’t get many comments. And yet when I run into readers, they often tell me to keep up the good work. Work colleagues also will reference the blog so I know the readership is there. My blog followers have been steadily increasing but I saw a dip this summer. That’s okay because I made a conscious decision to only post once a week instead of my usual twice a week. Most people who read blogs have no idea how often a blog publishes or what day the blog publishes. They simply get it as part of an RSS feed or as an email to their inbox. When I posted that I would be scaling back, I heard from several who applauded me for my efforts to slow down some. Scaling back enabled me to finish several projects for NFPW this summer. 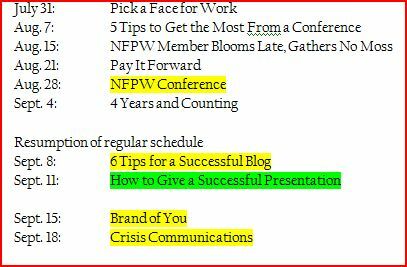 Had I not consciously scaled back I would have either missed several self-imposed deadlines for my blog and/or not finished projects for NFPW. As a communicator, I found the blog helps me research topics and distill the topic into the key points I need. I enjoy sharing what I’ve learned with others and it fits with my effort to pay it forward. Writing a blog also forces me to write each week. Of course, writing for communicators is a challenge because if I have not carefully edited my work, someone is quick to call me out on a grammatical error (please keep doing so!). I wanted to say thank you to everyone who subscribes to the blog, reads it and/or passes it on to others. I hope you will help me to continue to grow it by sharing it. And, equally important, let me know what you like and also what you want to see more of. Writing is hard work. All of you already know that. It’s even harder when there is no deadline at the end of the project like with this blog. If I write a blog, they will read it. I’ve created my own self-imposed deadlines. I post every Wednesday and Sunday. I often wonder what would happen if I just missed a day. But I already know the answer. It wouldn’t be long before I stopped writing the blog. And I don’t want to do that. At least not as long as I’m receiving comments from followers who say they are enjoying it and are learning something. Today is one of those days, though, where I didn’t have the energy for lots of research. I wanted to get a blog up so I started exploring what I had previously written. And then it hit me: write about the blog. This will be my 253rd blog post! There are almost as many comments. I have more than 100 subscribers, which does not include those of you who receive it in RSS feeds. To date, I’ve had close to 10,000 views. I wasn’t sure the same would hold true of the blog. Thanks to each of you, though, I’m seeing growth. My average monthly views has grown from less than 100 to more than 400. As with anything, if I’m going to succeed at this, I need to put time into it. I brainstormed topics today (hence, the late-day post), and next weekend I’ll dedicate to researching and writing. In the meantime, if you have any suggestions for topics, let me know. Editor’s Note: I recently attended WordCamp Richmond, which was all about blogging using WordPress. I learned a lot, felt overwhelmed at times and was inspired to write several blogs. This is the final one. Part 1 focused on whether to start a blog and Part 2 focused on blog comments. “We have a lot to talk about” was the refrain of several bloggers who write about their communities, whether it’s a neighborhood or a community built around the theater. During the recent WordCamp Richmond several bloggers shared their experiences in keeping a community blog going. John Murden also lives in a unique neighborhood in Richmond, known as Church Hill. “It’s a crazier neighborhood than I ever have lived in,” he told the audience. He cited the beautiful old houses and the hookers near his house. He started finding things that were important to the neighborhood such as historic preservation and the blog Church Hill People’s News was born. Mike Clark and his wife created a blog around theater reviews, ShowBizRadio. 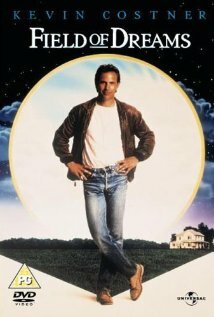 “Our review was the two of us talking about the show and recording it and putting it up as a podcast,” he said. They added interviews with actors, producers and designers. Then they added a calendar with show times and audition dates. They started hiring writers. “Now we go to less shows, but have more content,” Mike said. Scott says he tries to recognize the journalistic venture in his blog, but he also includes his opinions. And because he’s covering a small neighborhood, he has to be respectful of people’s privacy. He finds comments by listening, attending meetings and also checking out Craig’s List and foreclosures. A recent post highlighted a vintage 1950s blue vinyl chair and ottoman for sale. He then reminded the neighbors about an upcoming flea market. John, too, pulls from wherever he can. “The best is when I do my own reporting,” he noted. One piece he was proud of was comparing crime data from the worst crime year to the present. It took a lot of time, and that, said the panelists was the difficult part. The blogs are not a full-time job for them and most don’t get paid. “It’s hard to find the time,” John said. Editor’s Note: I recently attended WordCamp Richmond, which was all about blogging using WordPress. I learned a lot, felt overwhelmed at times and was inspired to write several blogs. This is the first one. Part 2 will focus on blog comments and Part 3 will talk about communities and blogging. When colleagues learn I have a blog, they often say to me, “I need to start one.” My next question to them is why? Don’t get me wrong, a blog is a great communications tool. However, if you don’t have a communications plan or a purpose for writing the blog, your blog is going to go into cyberspace and nothing will happen. Establishing authority: “If you’re the one with the mic people obviously assume you know what you are talking about,” he notes. Once you’ve decided that a blog is an appropriate communications tool for you or your client, you will want to establish an editorial calendar. I post on Wednesdays and Sundays so my calendar has all the Wednesdays and Sundays listed. I then go through and note possible topics. For example, I knew I would be attending WordCamp Richmond so I marked the dates closest to the camp as topics related to the camp. In September I always note that I will have three to four posts around the National Federation of Press Women conference. January is a good month to have a post around resolutions related to communications. An editorial calendar Bradley says “is a great way to make sure your blog doesn’t die.” Since establishing my schedule and calendar, I have never missed a post. A calendar forces consistency for me. When I run low on ideas, I have to spend some time researching so that I don’t come up short on a day that I post. A calendar also leads to new ideas. I met a student the other week for breakfast after he asked for advice about communications in the non-profit field. He tweeted about it, and it inspired a post on a day when I had not yet decided what to write about. The final benefit of an editorial calendar is that it forces consistency. Thanks to my calendar I have never missed posting on a Wednesday or Sunday. My readers have come to expect twice weekly posts. I don’t want to disappoint. When you’re ready to blog, don’t forget to create your editorial calendar. Whether you post once a week or once a month, it will help you with your content.